I made this for Jean Lee last Friday..a day before her departure to HK. 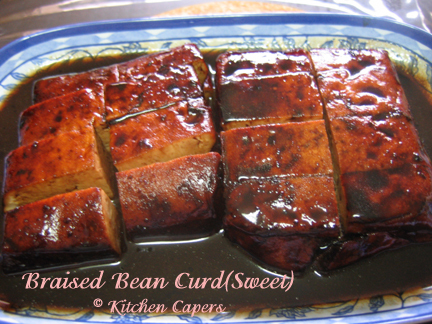 Its different from the regular Braised Bean curd recipe as those are savoury while this was SWEET! JL and hubby loved it. So I made another batch for dinner last Saturday for ourselves. Everyone loved it. 1. In a wok, add the sauce ingredients to boil. 2. once it starts boiling, lower heat to Low and simmer for 20 mins. 3. Add bean curd into the wok to cook for another 10 mins over low heat. 4. Turn/flip over the bean curd after 5 mins. 5. Remove and place on a plate. 6. Use a sharp knife and cut into smaller pieces. 7. Add some sauce over it. 1. Remaining sauce can be kept in the freezer and re-use each time. 2. just reheat by putting the thawed sauce in a wok. Add water to boil it. 3. Repeat process with bean curd.